Carl Hiaasen describes his fly box as a horrendous mess, full of experiments, some killer flies, and even a practical joke or two. But it's a potent collection when it comes to fooling bonefish. Carl Hiaasen photo. Carl Hiaasen is known among the reading public as a master of modern absurdity, sprinkling dirty money, politics, environmentalism and the oddities of tourism through more than a dozen popular books. Some of the fuel for his quirky plots comes from a serene, if equally unpredictable, pastime: fly fishing for bonefish. Hiaasen’s newest book is the paperback edition of Nature Girl (Grand Central Publishing, October 30, 2007, 320 pages). “I CAUGHT my first bonefish in May of 1970 while fishing with my pal Bob Branham, who of course is now a famous guide, in his aluminum jon boat over by Cotton Key. We had a 6- or 7-horsepower Mercury outboard and used a closet dowel for a pole. I think we had both just gotten our driver’s licenses and we would just load up the boat and go anywhere. Eventually we got up to Biscayne Bay and met Bill Curtis, who was tremendously helpful to us both. But bonefishing for me has always been a special kind of experience. It’s about being there in the middle of it all. I like to go out at sundown and fish for tailers and sure, I’ll look for the big fish first, but if they’re not around, I’m perfectly content to go cast at 5-pound fish. Of course bonefishing in the upper Keys has changed a lot. You have to work harder to find fish, and especially fish that will eat. Ted Williams used to pull out of Bud and Mary’s and show off by catching fish right in front of the crowds on the dock, on Tea Table Key. Now you come into the dock at the end of a day of fly fishing in Islamorada, and if you’ve caught a single 5-pound bonefish, you have had a good day — buy everybody a drink. But that’s OK. If you’re there because of the media hype or because you want to measure up and have something to brag to your buddies about, you’re there for the wrong reason. There’s a certain amount of derangement that goes along with it. I’m still amazed, of course, that you can cast to world-class bonefish with the skyscrapers of Miami in the background. The one extraordinary thing that has happened, though, is that it is easier now to catch a big bonefish on fly than on bait. I actually think the big fish have come to associated the smell of a crushed crab with pain. There’s no other explanation. It’s why we decided to fish the Islamorada All-Tackle Tournament with flies; we just thought we might have a better chance than the folks using live bait. But my flies are nothing special. My box is a wreck, as you can see. 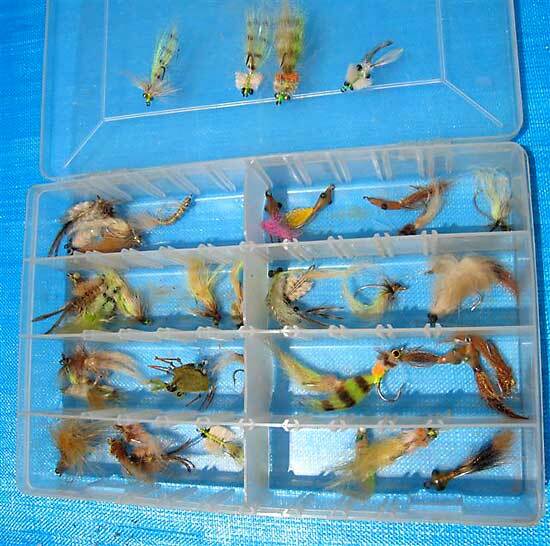 When I am trying to decide what fly to use, I usually put one in my hand and the first thing I’m thinking is, ‘How heavy is it?’ The flies you see here are all different weights and styles. Most of them are from Tim Klein, the guide I fish with most often. And most of them don’t even have names. Tim is a master of making subtle changes to a pattern based on the way fish are reacting to the fly and he doesn’t bother to name the patterns that he authors. In fact a few years ago a magazine writer wanted me to give him the name of my favorite fly, and since Tim doesn’t worry much about names, we didn’t have one. So the writer just pulled some name from a catalog. You see quite a few epoxy flies in there. Many of those were given to me by Bob Branham and we use those mostly on mudding oceanside bonefish in Biscayne Bay and Islamorada. The ones you see at the top of the photo on the lid are flies that Tim tied; we use those on skinny-water fish in the backcountry. 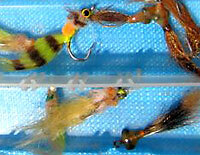 They are all of different weights, with the small fly on the left being the pattern we usually use on big tailing fish. The one with the strand of orange yarn near the back is one we’ve used recently. Tim will usually have me throw only a couple of casts before deciding whether a fly is right or if we need to switch. There’s also a Harry Spears toad in there somewhere, and a couple of crab flies, including one small crab fly that works very well. I don’t think you’d catch anything on that big green crab you see there in the middle; not sure why it’s in there, or why the pink-tailed epoxy fly is either — Bob probably dropped it in there as a joke. The barred tail feathers are something I think that came from Bill Curtis. Bill was tying all kinds of interesting flies decades ago and some of them were quite inventive. I caught on a permit on a fly of his that he made from the lid of Quaker Oats boxes. We’d throw it at fish on the flat edges and kind of drift it into them. It would sink just below the surface and float right at the level the fish seemed to like. Of course they didn’t last very long, because after a few casts they got waterlogged. But Bill came up with the idea of putting bars on the tails of his flies with a magic marker; I think it came to him as he was tying flies to imitate pinfish. There are so many features of patterns today that are wrongly accredited to newer tiers. But I think, Why would anyone really care so much about authorship? It’s really about the fishing, and the folks who are really making the improvements in patterns aren’t all that interested in seeing their names in a magazine; they just want to catch fish. And that’s kind of my feeling about my flies. I don’t obsess over the details. If they work, I keep using them, and some days I will fish the same pattern all day long. Other days I change flies six times in an hour. The things that really matter, I think, are how you present the fly. I always throw at the lips. If the fish doesn’t see the fly, they can’t eat it, and I would much rather have a fish blow up because I cast too close than never know whether it was going to eat. I fish a 7-weight almost exclusively for the big fish now — something Sandy Moret turned me on to. It allows you to cast so much closer to the fish, make a much softer cast and more delicate presentation of the fly. But I’ve caught a 14-pound fish on the 7 and it was terrifying. I almost got spooled a couple of times. Fortunately some sharks showed up and the bonefish decided he’d better get up real shallow on the bank. But my idea of selecting flies is to go into Sandy’s shop and just start picking stuff out of the bins. If I catch a fish, I might come back later and ask him what the name of the fly is, and he’ll say ‘Yeah, that’s a so-and-so fly.’ That’s about as much as I know about them. It’s hopelessly unscholarly, I know.